The Kluane Lake Research Station (KLRS) is owned and managed by the ArcticDefinitions of the Arctic vary according to environmental, geographical, political, cultural and scientific perspectives. Some scientists define the Arctic as areas having a high latitude, long winters, short, cool summers,... More Institute of North America (AINA), which is a non-profit research and education institute housed at the University of Calgary. 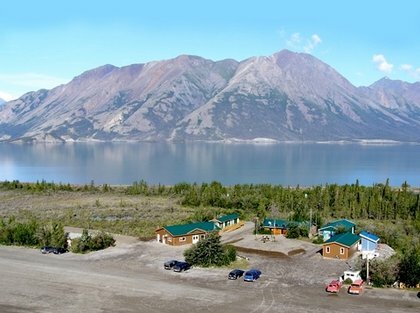 KLRS is located on the southern shore of Kluane Lake, in the southwest corner of the Yukon Territory, Canada. The research station is situated on the traditional lands of the Kluane First Nations and Champagne and Aishihik First Nations, and is in close proximity to the Kluane National Park and Reserve, which is a UNESCO World Heritage Site. The extreme elevation difference between Kluane Lake and surrounding unfragmented borealNorthern, from Boreas, the Greek god of the north wind.... More forest and grasslands, and the crest of the St. Elias Mountains, including Canada’s largest mountain Mount Logan, establishes a strong gradient in environmental attributes and results in a remarkable diversity of research opportunities within a small geographical area. This diversity is reflected in the unique scientific legacy of KLRS. KLRS was established in 1961 by Walter Wood and the Arctic Institute of North America. Wood had been mapping, photographing, and collecting climateThe average weather we would expect over a long period of time (seasons, years, decades). Climate varies from place-to-place across the Earth. Climate is determined by long-term (over at least... More data in the area since 1935. The station has evolved from a few tents beside a military airstrip to a comfortable base camp providing support for several satellite field camps. Up to 40 researchers can use the facility all year-round. KLRS has hosted a wide variety of disciplines over the last 50 years. The main projects have been related to geologyThe study of the solid Earth, rocks and processes by which rocks form. 'Geo' is derived from the Greek word for Earth.... More, glaciologyThe study of glaciers., and geophysics in the ice-field region; high-altitude physiology on Mt. Logan; a collaborative project investigating long-term interactions within the boreal forest; climate modelling; and regional remote sensing. The KLRS Bibliography can be accessed at http://www.aina.ucalgary.ca/scripts/mwimain.dll/144/klrs?DIRECTSEARCH. The Arctic Institute of North America also maintains a major data base called ASTIS, and publishes the quarterly journal “Arctic”. The study area at Kluane is within the traditional territory of Kluane First Nation (KFN) and Champagne and Aishihik First Nations (CAFN). Members of these local communities were instrumental in research productivity during the formative years of the research station, and continue to be active partners in station based research. We now work together developing programs for community youth to be involved in scientific research. The Station can be accessed by the Alaska Highway via Whitehorse, a community of 35,000, with an International airport that receives at least five flights from major Canadian cities each day. Vehicle rental is available in Whitehorse. The drive to the research station takes two hours on a paved highway.